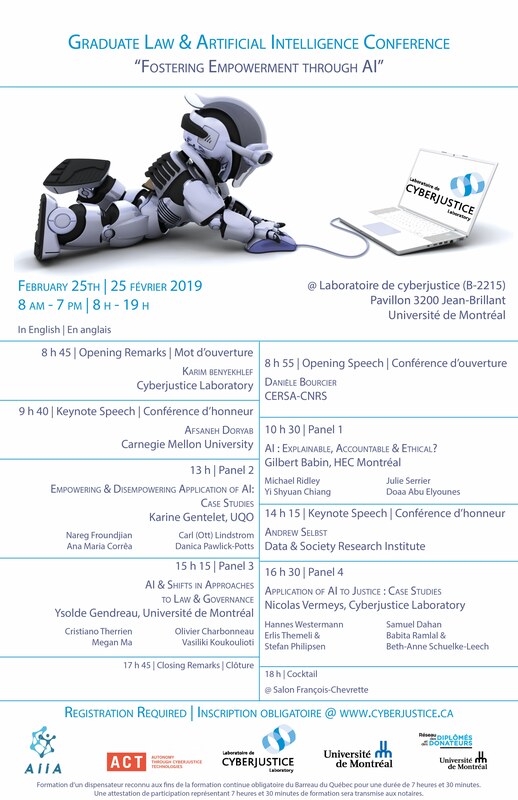 The Cyberjustice Laboratory invites you, on February 25, 2019, to the first edition of the Graduate Law and Artificial Intelligence Conference – GLAIC, where a group of promising young researchers from around the world will present their research on the subject of artificial intelligence (AI) and law, from an interdisciplinary perspective. Supported by the Autonomy Through Cyberjustice Technologies and Artificial Intelligence (ACT) Project, and in line with the International Conference on Artificial Intelligence and Law (ICAIL 2019) that the Laboratory will host from June 17-19, 2019, this day will be an opportunity to take stock of the state of research and of the issues surrounding ethics, governance, accountability, etc., regarding the application of AI in the legal field. We will host several keynote speakers for the occasion. Recognized as 7.5 hours of mandatory continuing education by the Barreau du Québec. A certificate of participation representing 7.5 hours of continuing education will be provided for notaries. Panel 1 - Artificial Intelligence: Explainable, Accountable & Ethical? Fair, Ethical and Just: Can an AI Algorithm Check All the Boxes? What are you tAxIng about? This content has been updated on 02/26/2019 at 10 h 22 min.